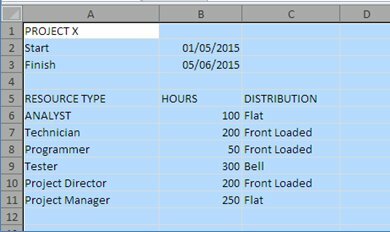 Using Excel spreadsheets to manage resources across the project and services workload is fine for small departments. However, for larger resource pools, spreadsheets can quickly multiply whilst project changes make them difficult to maintain. Cobbling together multiple spreadsheets to get the big picture becomes onerous and the end result can lack credibility. If resource planning with spreadsheets is no longer working for you, then Innate Resource Management Software is the next logical step. With a web based spreadsheet style interface to a central database, it can rapidly convert your Excel spreadsheets into a robust, multi-user operational system. Create work profiles using standard curves, with drag & drop and copy & paste to finalize the estimate. Summarize or drill down a work breakdown structure, to show work profiles at portfolio, project, or task level, for example. Can we continue using spreadsheets to prepare resource plans? So, if resource planning with spreadsheets no longer works, converting your spreadsheets into Innate will transform your resource management system. The data becomes current, complete and consistent, multi-user access can be controlled by workflow steps, and details of who changes what easily tracked. The improved credibility of the data gives greater confidence in the management information.